The purpose of Sporebuster is to assist soybean farmers in making a fungicide program decision that is profitable for their operation. 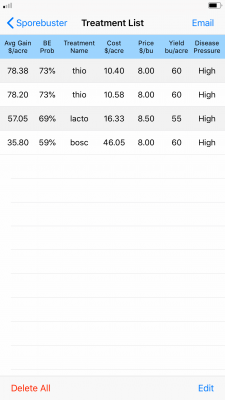 SporeBuster is meant to complement Sporecaster, which is a tool that can be used to make the decision whether a fungicide application is even needed. 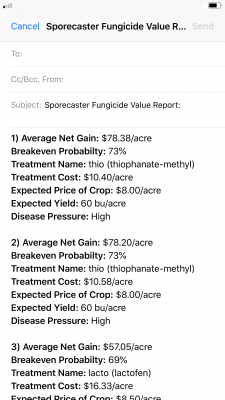 Once Sporecaster recommends a fungicide application, Sporebuster can be used to determine a profitable program. Information that drives Sporebuster is based on research from 2009-2016 from across the upper Midwestern US. Statistical models were developed based on these data that included white mold pressure and yield response from fungicide for 10 common fungicide programs. To begin, the user inputs their expected price per bushel that they will sell their soybeans. They will also be asked to input their expected yield for the location for which they would like to run the calculation. Finally, the user must choose the anticipated disease pressure at that particular location. 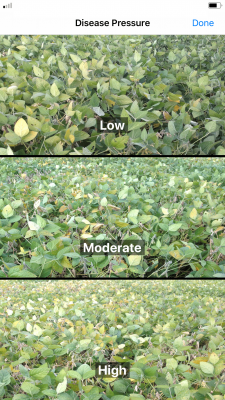 We have included adjustments in the model for low (Low), moderate (Mod), and high-pressure (High) white mold situations. Clicking on the information button next to the disease pressure buttons will show pictures of each disease pressure. 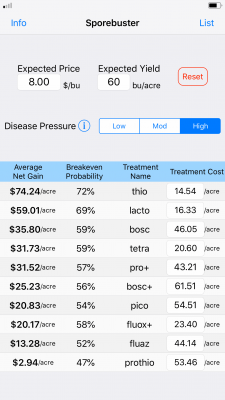 Sporebuster then calculates the average net gain per acre and breakeven probability using list pricing for treatment costs for the 10 programs. 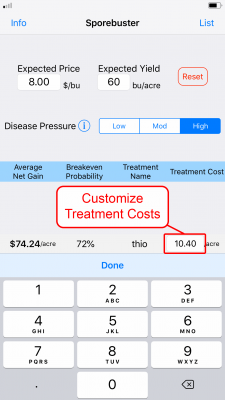 Treatment costs can also be set manually by clicking the treatment cost box of a particular treatment and entering a cost. This information can then be used to make a decision on a program that might be most profitable for your specific operation. Changing any input will automatically recalculate all values. The RESET button can also be pressed to start over with no input values and default treatment prices. After a calculation has been completed, any treatment option can be tapped to bring up a dialog box. This box allows you to add that treatment option to a saved list, which will be saved even after the app is closed, and can be accessed by clicking the List button on the top of the screen. You can add as many treatment options as you want, and they can be from different calculations. The list is automatically sorted by average net gain per acre. From the List screen, you can send an email with the information for all the treatment options in the list. The email automatically creates the text as well as a CSV attachment with the same information that can be opened with any spreadsheet application, such as MS Excel. Treatment options on the List screen can be deleted by swiping left and clicking DELETE, or by tapping the Edit button. For common fungicide ratings, rates and trade names, see Table 3-10: “Fungicide efficacy ratings for foliar soybean diseases in Wisconsin.” in University of Wisconsin-Extension A3646 Pest Management in Wisconsin Field Crops. This tool is for guidance only and should be used with other sources of information and professional advice when determining risk of white mold development. The information in the app and this publication is only a guide, and the developers assume no liability for practices implemented based on this information.